CATHOLIC GIFT SHOP LTD - 18 Catholic Christmas Cards Boxed Peace - Joy - Love. 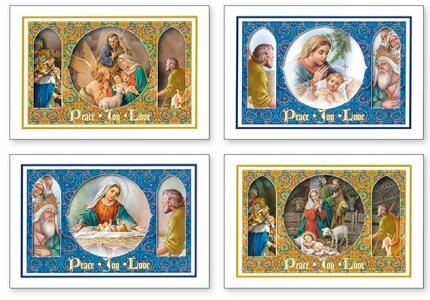 18 Catholic Christmas Cards Boxed Peace - Joy - Love. Design 1: With Best Wishes for Christmas and the New Year. Design 2: Wishing you a very happy Christmas and Peaceful New Year. Design 3: At this Christmas Season and throughout the New Year may you be blessed with every happiness. Design 4: May your Christmas be fillet with Peace, Love and Joy and may the New Year bring you happiness. 4 designs with envelopes, size: 16.5 cm x 11.5 cm.